Support beams are crafted with two logs and a saw. Both logs must be the same type, but any log can be used. Different types of wood will result in different types of beams, but this difference is purely cosmetic as they are work equally the same. 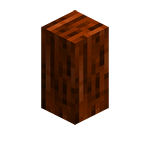 Beams of different types of woods can attach to one another. Support beams are used to prevent cave-ins. This prevention is applied with the horizontal section of the support beam in place. 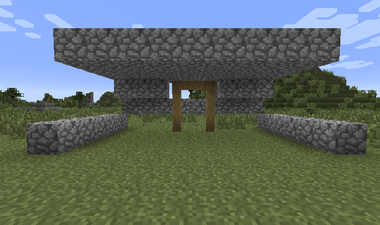 Vertical or corner support beams will not help in preventing a cave-in. Support beams must be built vertically at least three blocks high in order to support placement of any horizontal beams. Support beams can only be placed horizontally between two vertical beams that are up to 5 blocks apart. Support beams can be placed vertically to any height. Support beams will place the first 3 blocks all on their own, and any additional beams must be placed one at a time. To override the first 3 behavior, hold (Default:⇧ Shift) while placing. 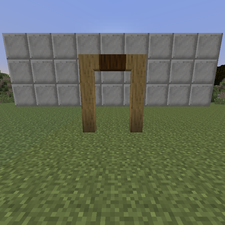 A single horizontally placed support beam will prevent cave-ins from originating from an area that is 4 blocks in each horizontal direction, and 1 block above and below the beam (9x9x3 Area). Raw Stone that is within this area can still cause cave-ins that originate outside the area when mined. 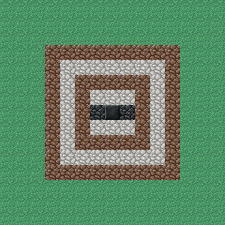 Raw stone that is mined, regardless of if it is supported or not, will randomly scan an area that is 4 blocks in each horizontal direction, and 2 blocks above and below the raw stone (9x9x5 Area). If this random scan finds raw stone or ore that is unsupported, the unsupported block will become the epicenter of a cave-in that will then spread outwards. Unsupported blocks that are the epicenter of a cave-in can also propagate cave-in's back to supported areas. Cave-in's that fall on a support beam will break that block, and all other connecting horizontally placed support beams, before continuing to fall to the ground. Additional broken support beams may then cause other collapses of gravity-affected blocks to occur. Support beams are a tool for cave-in prevention, and not protection. Mine safely! Example of support beam holding up cobblestone. Notice the blocks on the far edges weren't supported and fell. Example of support beam holding up the maximum amount the entire beam structure can handle. Black stone = beam location. A cross section of the supported area of a single horizontal support beam. This page was last modified on 6 November 2015, at 02:26.